You may only know the name Crabbie for ginger-based drinks, but the booze brand was started back in 1801 by Edinburgher* John Crabbie who sourced and blended whisky and sold them under his own name. 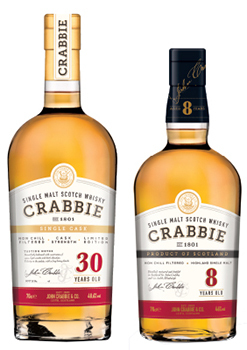 After an absence from the whisky scene since the 1970s, the Crabbie name is now back on whisky bottles, celebrating its return with two single malts carefully selected from some of Scotland’s finest cellars. That pair of whiskies is a Highland single malt, sold as Crabbie 8 Year Old, and a single cask release of 336 bottles of Speyside single malt, badged as Crabbie 30 Year Old. While the former should be readily available, the 30 Year Old is likely to have sold out by the time you’ve read this – even with its £500 per bottle price tag – but it’s not that often we get our mitts on such an expensive drop of booze** so that’s the one we’re featuring to tell the Crabbie story. Type this whisky name into google and you’ll see a flurry of excitement about its release. The whisky is a Speyside single malt, bottled at 48.6% and, besides praising its taste and showing excitement for the return of the brand, you’ll also find a lot of conjecture on what distillery it was sourced from. If you’ve asked the ‘what distillery’ question of google and found us, then sorry, we haven’t got the foggiest idea. The long-term plan for Crabbie’s Whisky, owned by spirit giant Halewood, is to begin continuous single malt distilling in Edinburgh but, until those barrels are ready for bottling, the brand is reviving its founders expertise at sourcing other whiskies for its own label products. My initial sniff of this expensive tipple revealed a lovely clean whisky perfume with an almond sweetness to it. The taste was, at first, very intense with oaky spices engulfing the senses and boozy goodness penetrating deep into the bones. I added a splash of the Mendip’s finest tap water to the glass which allowed the hints of almond to nudge forward while the rich spicy notes remained in tact. Not content with his whisky sourcing and blending business, John Crabbie also dabbled with ginger wine and records show that a first sale of the two drinks was to ‘MacDonald of Glenalbyn.’ Not content with blending just whisky, it is from this liaison that whisky and ginger wine first joined forces in a glass, originally known as a Whisky MacDonald and now referred to as the Whisky Mac. *What are people from Edinburgh called? **We were sent a dram, so don’t come knocking on my door expecting to take a snifter of rare, expensive whisky. It didn’t last long. The post Crabbie 30 Year Old Whisky – an old name returns appeared first on Two Thirsty Gardeners.